Manuel Gómez Navarro is a lecturer at Boise State University in the Department of World Languages where he teaches Spanish, Literature and Culture. Last fall he attended an introductory VR workshop on campus and was convinced the technology could have a powerful impact in some of his courses. 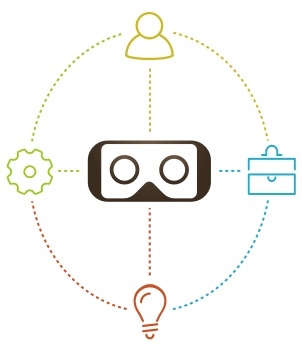 He started looking for more information on VR and stumbled across Erika Liebel’s IVRC blog on using VR in her secondary school Spanish classes. He joined the IVRC as a member in February of this year and has been an active part of the community since! We recently caught up with him to hear more about his use of VR in his courses at BSU. Here’s what he had to say! IVRC) What inspired you to start using VR with your curriculum? M: The idea came from using Google Street View with students and having them explore Spanish cities in my classes. From there I thought -what if the students could have more information and more interactivity, maybe videos, and even sound, from the 360 photos they are exploring? I then started doing some internet research and learned how popular virtual tours in real estate were becoming. Some of them had the interactivity I was looking for so I dedicated a lot of hours testing real estate virtual tour platforms, understanding how VR tours worked, and rethinking how to use this technology to create virtual tours with a cultural/educational focus. IVRC) When did you start using VR in classes? What experiences/tech did you use with students? M: I started using VR in my SPA376 Spanish Peninsular Culture and Civilization class, in Spring 2018. I asked my students to buy affordable VR headsets ($10) and through their smartphones, they accessed links to 360 photos, 360 videos, and virtual tours I created for this class. IVRC) What was the response? M: The students loved it! Not only for feeling more immersed in the experience, but they had literally the “whole picture.” They were able to look in detail around them and have a more comprehensive understanding of the site. Some of them pointed out that it was an experience close to being there. After the exploration, the conversations with their classmates about what they viewed were vivid, eagerly asking for vocabulary to describe what they wanted to communicate. IVRC) What has been the most challenging aspect of incorporating this technology? M: I spent hours researching different kind of headsets, and suitable platforms to build the virtual tours. I was looking for a web-based VR player (the ones in which you can activate hotspots, media, and links when you look to a specific point.) To my surprise, that is not very common. My goals were easy access with a smartphone and interactivity. Finally, I found viar360.com, it has a drag-and-drop editor, very intuitive, and with the tools I needed. IVRC) You've been creating your own content, tell us about that process. IVRC) How do you feel immersive technology is (or will) change the learning process? Can you speak to what you have seen in the year you've been using it? IVRC) Where do you see your VR journey going from here or, Tell us what the future looks like for your use of VR in the classroom and what you're working on. M: I see an increasing use of VR in my classes, especially in those with a strong cultural component. I’m planning trips to record 360 videos about Hispanic cultural events for use in the classroom. In the near future, I see my students pulling VR headsets (bought by themselves or the university) out of their backpacks and it being totally normal to have a class interacting with this technology. Right now, I continue to research suitable VR tour creation platforms online for making cultural virtual tours. On the other hand, I’m testing different equipment for taking high resolution 360 photos and videos in order to provide a more realistic and detailed experiences. Finally, I´m researching 3D immersive experiences and literary works gamification (an inspiration has been Joycestick). I've been testing blocksmithxr.com, with promising results and looking for institutional financial support.